I love the transition into a new season (maybe not so keen on winter though!). I enjoy making some subtle changes to rooms in the house, whether it be seasonal decorations, the addition of some candles or warmer bedding. I tend to keep our throws out all year around though, thanks to the fibromyalgia I can be freezing cold in the middle of a heatwave! 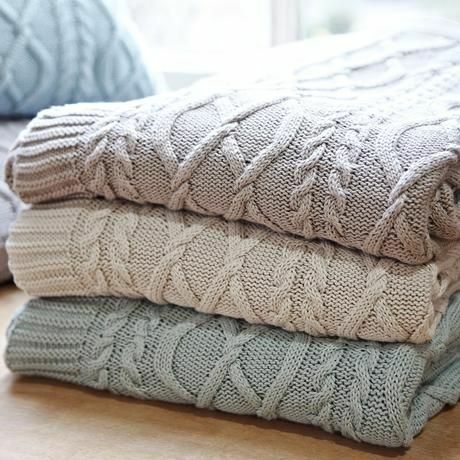 I do like to give them along with our blankets and cushion covers an extra launder before autumn sets in. There’s nothing like snuggling up of an evening with a soft, fluffy blanket and watching a good period drama! It was perfect timing that I was sent a bottle of *Comfort Pure Ultra Concentrated Fabric Conditioner as I had been thinking it’s getting close to transition time! I’ve been using 3-in-1 capsules for a while now. I’d found some that smell nice and that our sometimes over sensitive skin didn’t react to and in all honesty they were more convenient with the amount of washing I usually get through. That being said after using the Comfort Pure I won’t be going back. When I poured the ultra concentrated liquid into the machine I was a bit sceptical about how a tiny amount could deliver the fragrance and softness it was claimed. I was proved wrong though, my laundry hasn’t felt so soft and fresh in a long time. The fragrance is subtle and inviting and I happily used it for the next wash.
I’m not looking forward to losing the sun but I can’t say that I’ll be too disappointed for the arrival of cooler evenings, meaning the log burner can be lit and I’ll be wrapped up on the sofa. * I was sent this product for the purpose of review. All opinions are 100% my own. If you’ve been following here for a little while then you’ll know that I’ve been desperate for a little get away (sorry about that whinging!). A full scale get away wasn’t on the cards but a mini break in this country definitely was and it shouldn’t come as any surprise that Cornwall was always going to be on my radar. Relatively last minute we booked onto a holiday park and headed down to Newquay for a long weekend. Amazingly I only forgot to pack one thing. Disappointingly it happened to be my camera left on the chest of drawers after being charged, leaving only my iPhone to snap away on with varying results! I’ve made numerous trips to Cornwall but I’d never been to Newquay. Although the High Street was a little too touristy for my liking (I think I’ll always love St Ives), we found some lovely little coffee shops which had an abundance of gluten free offerings, and the beaches were as beautiful as other parts I’d visited. We steered clear of Fistral Beach as it was completely rammed with the Boardmasters Festival on over the weekend, but when we made it down to the beautiful and smaller bay I really started to relax. After a dreary and drizzly morning the cloud broke and the weather was hot and sunny, perfect for sunbathing and lounging around for a few hours. It’s easy to forget that you’re in the UK when the weather is so lovely and the crystal clear water is lapping up on the sand. I think that it’s the most relaxing sound and always brings a sense of calm over me and leaving the beach on the last evening with the thought of having to return to normality the next day, left me feeling quite sad. It was lovely to get away for a few days and it is safe to say that we won’t be leaving it so long to return to the haven that is the Cornish coast, most definitely with a good book in hand. So August is here and we’re smack bang into the school summer holidays (ahem, weather take note!). As the lack of posts around here will no doubt show I’ve been struggling to juggle everything since the kids broke up and as previous summers will also show, I was a bit crazy to think that this year I could manage it all. It’s kinda stressed me out a bit to be honest and made writing all the more difficult, so in order to relieve some of the stress and improve the quality of my posts I’m going to change things up here a bit for the summer. Until September, I’ll be posting three times a week; Monday, Wednesday and Friday. I’m not too sure of the format yet, however one will definitely be fitness related as I need to be accountable through the summer months and have a reminder to actually work out. From September however I’ll be ramping things up here and this blog will be turning a corner with new, regular features which reflect my life as it stands now. I’m looking forward do documenting my new found inspiration and building this space into something bigger. 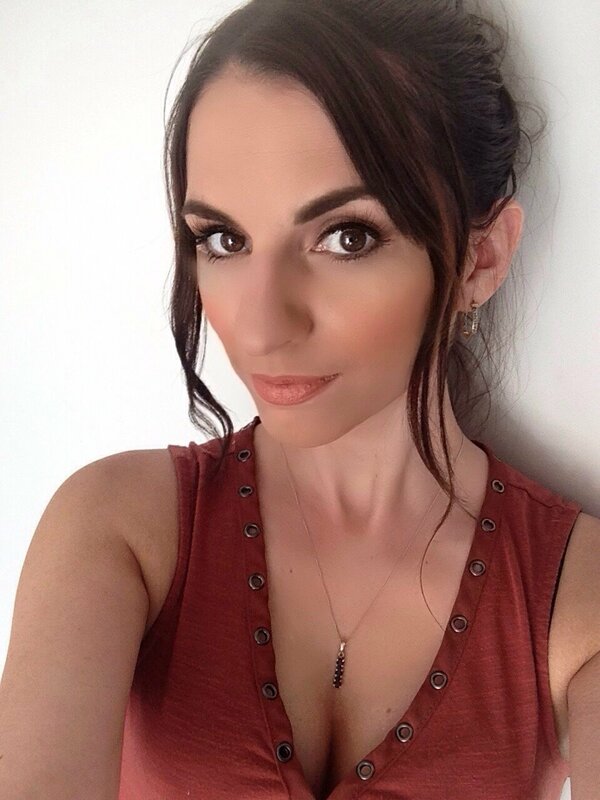 In the meantime I’ll be hoping for lots of sun, fun family days out and enjoying the time developing my content for the coming months. The weather has been so good to us this week (minus the interruption of rain yesterday. I love this mini heatwave and being able to work outside in a bikini while topping up my tan, I’d call that the best example of multi tasking. As I wrote on Wednesday by night the fibro pain has been almost unbearable so I’ve not been able to do much, but laying in the sun during the day has helped alot. 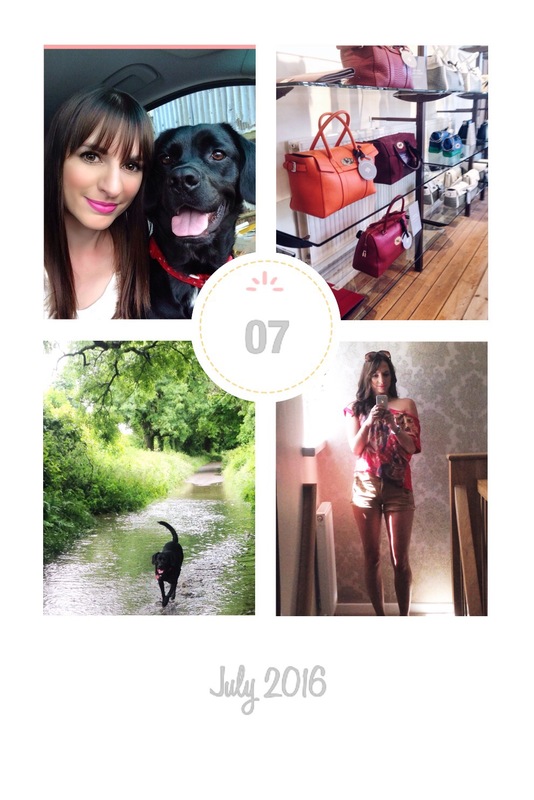 Here are some of my favourite things from this week….. 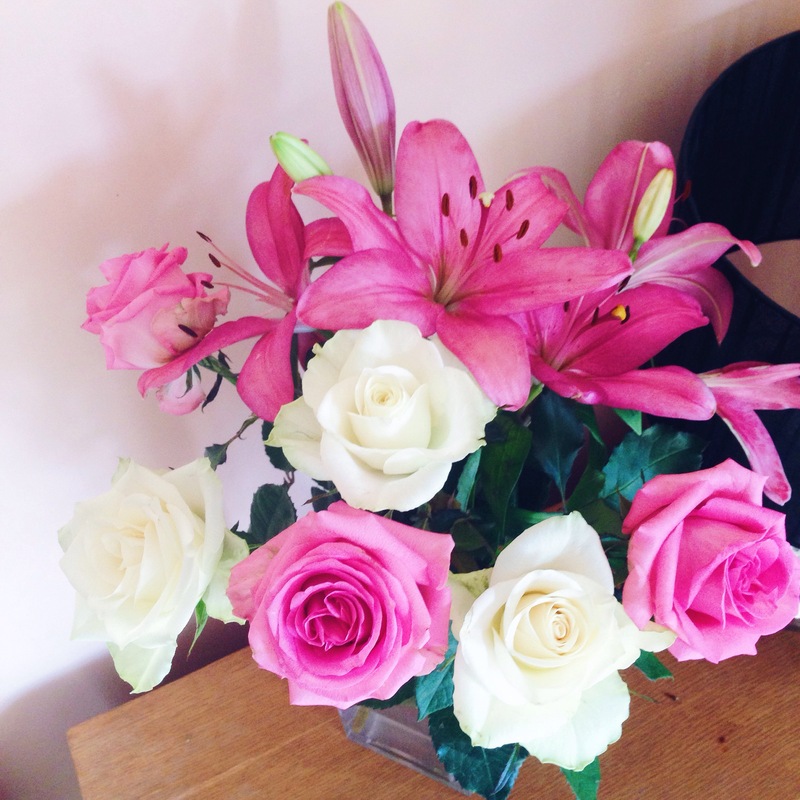 It was my daughters 14th birthday this week which coincided with the hottest day of the year so far. 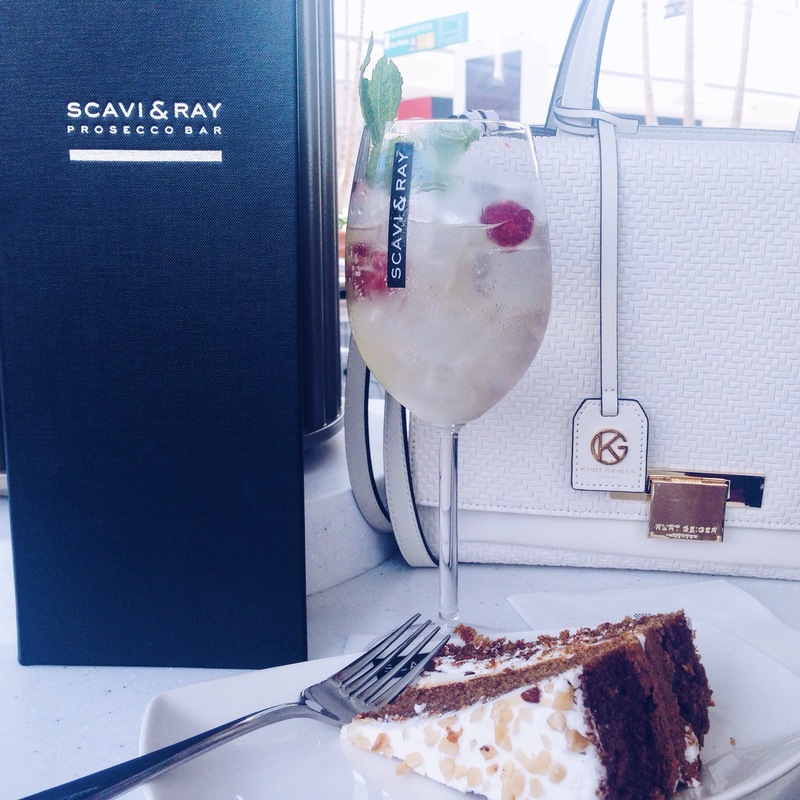 While she shopped with her sister and friend at The Mall at Vribbs Causeway, we made the most of a quiet hour and to cool down a bit with an ice cold Savage Ice Prosecco and slice of gluten free cake at Scavi & Ray. Working in the sun. Enough said. Although convinced that I’m definitely suited to a warmer climate I’ve scoured Pinterest to look for my perfect sun terrace to work every day. Tanya Burr Bright and Early Nail Polish – there’s nothing like a bright colour on your nails with a tan and this has been my go to. It may be too hot to even consider wearing trainers or boots but there’s nothing wrong with some advanced planning and window shopping. The new Gina AW collection is to die for! I’m loving these Sita Silk Pannelled trainers and the Boheme Black Suede and Diamante boots, which will be available soon. Plus if you can’t contemplate winter yet there’s always a selection of beautiful sandals to swoon over! It’s been a while since I’ve written a favourites post and I didn’t fancy posting what was planned after all today, so here’s this instead! Things have gotten a bit deep and depressing lately don’t you think? So here’s some snippets of some of the highlights of life this week. 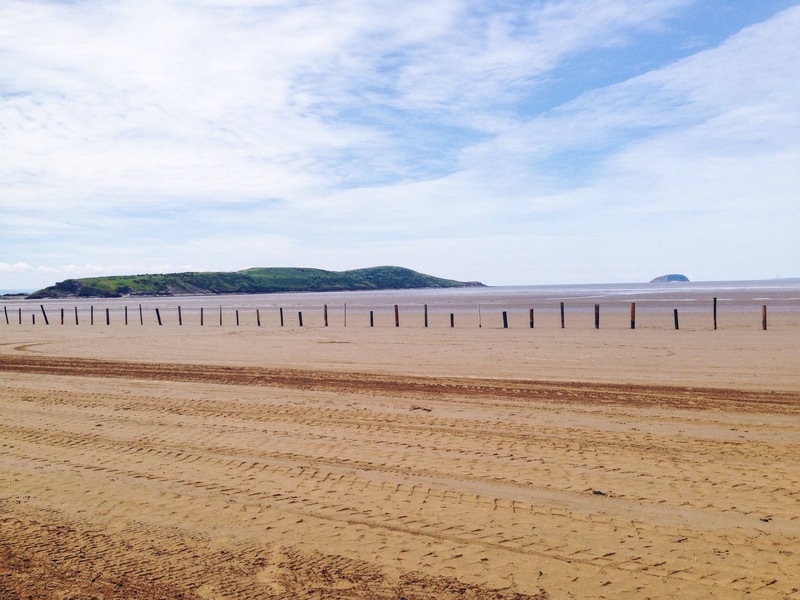 Taking the dogs to the beach in Weston Super Mare for a relaxing lunchtime walk sans children. It was the perfect weather for a stroll, the sun was out, there was no breeze and the dogs had a good run about and play. All lovely until we got locked out of the car which resulted in four people, a JCB, crowbar and wire coat hanger required to retrieve the keys from the drivers seat. I kid you not, you couldn’t make this stuff up! 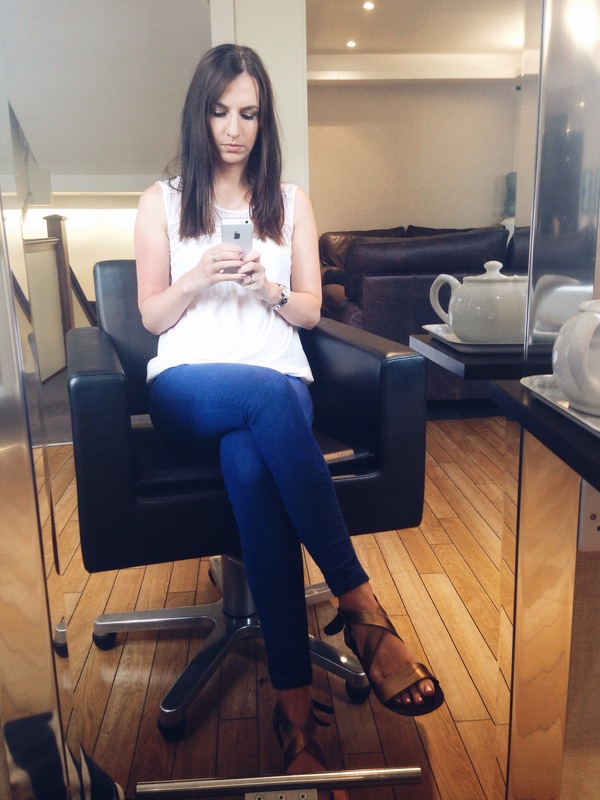 Sitting down for an hour or two at the salon for a colour, cut and to switch off from the outside world! Love being welcomed with a pot of tea and biscuits on a Monday morning. 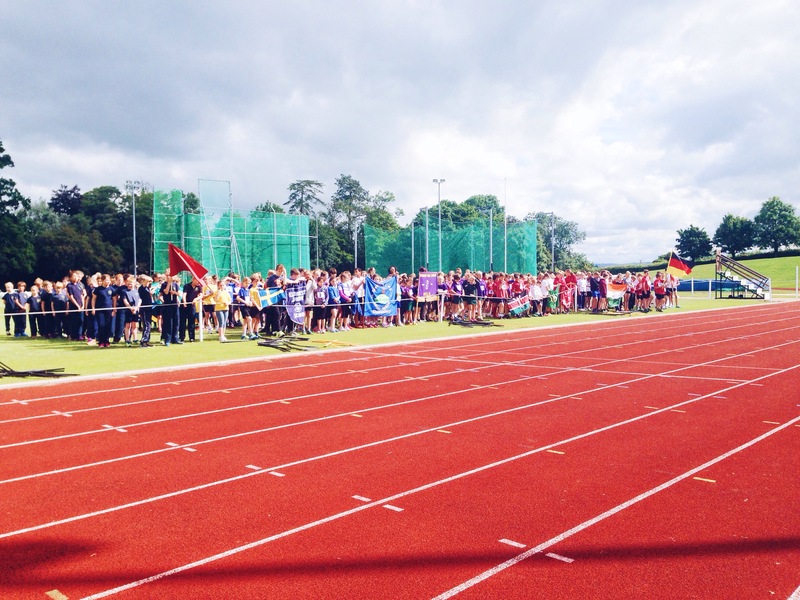 I spent a fab day at Millfield Athletic Track for the Mendip Primary Schools Mini Olympics. As much as I love coaching higher level athletes, the enthusiasm, excitement and team spirit from the children was a breath of fresh air. There were also some extremely talented youngsters who I hope / look forward to seeing coming through the ranks in the future but every child gave it their all and the rain stayed away! A bit blurry taken last night but I never have to worry about sleeping alone – these two won’t have it! What I’d give to be sat by the sea in some tropical location right now, with the sun beating down on my face and the sea lapping up at my skin and not just because the mother of all thunderstorms has just ended (well it had when I first started writing this post!). The need for an escape has been building up for quite some time and I know that I am not the only one feeling like the outside world is growing increasingly hostile and toxic. I made the decision two weeks ago to stay off Facebook for a little while, I turned off my notifications and to be completely honest I didn’t miss it one bit. As jetting off into the sun isn’t an option at the moment I’m having to try and centre myself again from the comfort of my own home. After a few months of not eating aswell as I should and not really training I’ve started to turn that around and get back on track. I’ve started training the past two weeks and getting my eating back to as clean as possible. I’m not being too strict on it at the moment as I have a meal plan in place which has specific goals but I have to ease my head back into the game for it to work. I’m struggling with motivation at the moment and don’t seem to have the same enthusiasm as I usually do when it comes to working out. Without wanting to sound too hippy-ish, to help get back into the place where my head needs to be I have turned back to meditation podcasts. I don’t know why I stopped really as just ten minutes makes such a difference to my sense of well being and ability to cope with the outside world. A few people have asked which I use so I thought that it would be handy to post them here. There are numerous sites that offer guided meditations and a quick search on the web or iTunes will bring up a good selection. I found The Meditation Podcast a few years ago when I was going through a particularly difficult phase of insomnia. To be completely honest I laughed at the narrative on the podcasts for the first couple of listens, but I stuck with it and I usually fell asleep before it ended. There are currently 34 episodes to choose from which deal with various issues such as calming the body, fear, positive thoughts and sleep. Another podcast that I have used is Meditation Oasis. Both are free with the option to donate if you find them useful and I want to stress that this is not a sponsored post, just something that I’ve found makes a difference to my motivation and well being. Fingers crossed with a good cleanse and a new mindset I’ll be back to tackle my goals and everything else that is thrown my way!